Israeli soldiers invaded, earlier on Wednesday at dawn, Azzoun town, east of Qalqilia, and Tal village, southwest of Nablus, in northern West Bank, and abducted four Palestinians. The soldiers also invaded Silwad, near Ramallah, and the al-‘Arroub refugee camp, north of Hebron. 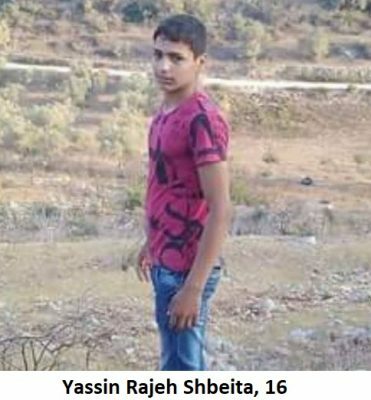 Media sources in Qalqilia, in northern West Bank, said several army jeeps invaded Azzoun town, east of the city, searched homes and abducted a teenage boy, identified as Yassin Rajeh Shbeita, 16, in addition to Bassam Nabil Hussein. The soldiers also invaded and searched many homes in Tal village, southwest of the northern West Bank city of Nablus, before abducting two young men, identified as Luay Hassan al-Bahti and Ma’rouf Bassel al-Hindi. In related news, several army jeeps invaded the al-‘Arroub refugee camp, north of the southern West Bank city of Hebron, before searching homes, and interrogated many Palestinians while inspecting their ID cards. The soldiers also fired live rounds, rubber-coated steel bullets, gas bombs and concussion grenades, at dozens of youngsters who protested the invasion, and hurled stones at the army jeeps.